As is well known, Beethoven’s only opera Fidelio was pretty much of a failure at its first performances in 1805-06. In 1814 he returned to the score and subjected it to a major overhaul in which only one number – the jaunty little march to accompany the entry of Pizarro – remained totally unchanged. It was in this later revised form that Fidelio proceeded to establish itself in Germany and eventually throughout the world. Apart from an abortive attempt made at the Metropolitan Opera in New York to provide the score with recitatives to replace the original spoken dialogue, the work remained undisturbed by the excavations of scholarship although Beethoven’s original manuscript survived. In fact one number went missing – but more of that later. It was not until the period after the Second World War that attempts were made to present Beethoven’s original thoughts – now given the inauthentic title of Leonore to distinguish it from the later revision — although it appears Beethoven might have preferred it were it not for potential confusion with other settings of the same text. In this format it was given in the context of various stage and concert performances – I remember two such in London during the Beethoven centenary year of 1970. It was not included in DG’s comprehensive Beethoven Edition issued that year, and the set here was the first attempt at a commercial recording of the score, originally issued on LP in 1977. It has to be said that practically all of Beethoven’s amendments to the original score were undoubted improvements. Ernest Newman, in More Opera Nights, thought that the original ending of Florestan’s aria was better in the original form than the more upbeat revision. The original version of the opening line of the duet O namenlose Freude! with its vocal lines soaring up above the stage may have been more practicable as amended, but is undeniably less exciting. Indeed once the listener has heard Beethoven’s first thoughts on this duet, they may find it difficult to dismiss them. That said, in the dramatic context of Leonore the issue of the conflict is far less obviously resolved than in Fidelio, since in the earlier version Rocco has taken Leonore’s pistol from her and when the reunited lovers first hear the approaching crowd they fear the worst. This is the one point where Beethoven actually altered the dramatic staging of the opera, rightly considering that the liberation of the prisoners was an act better performed in the open air of the courtyard than in the confines of Florestan’s dungeon. 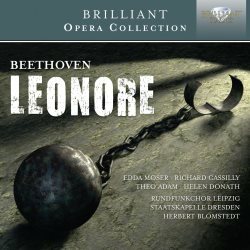 There is however, more to be gained from listening to Leonore — as an occasional alternative to the later Fidelio — than what Lord Harwood described in Opera on Record as “the sheer quixotic pleasure of listening to Beethoven’s first thoughts.” In the process of revision Beethoven deleted altogether two numbers (a duet and a trio) which would undoubtedly have sat uneasily in the revised score, but which his friends besought him to retain. No music produced by Beethoven in his mature years deserves to be neglected, even if Beethoven saw no place for it in his final version. There is one other minor textual problem; apparently the original version of the Act Two melodrama was removed from the score during the run of the 1805-6 performances. The revised version which has perforce to be employed in its place contains a back reference to the final version of Florestan’s aria which has not been heard in Leonore. This is a minor consideration, and not much could have been done about it. The casting of this set has been undertaken with considerable care, although it is not entirely satisfactory. Three of the singers had already set down their interpretations in complete recordings of Fidelio: Theo Adam as Pizarro in the Karl Böhm set of 1969 (also recorded in Dresden), and Helen Donath and Karl Ridderbusch as Marzelline and Rocco in the Karajan set of 1970. All are eminently satisfactory, as is Eberhard Büchner as Jacquino; and the presence of Reiner Goldberg and Siegfried Lorenz as the two Prisoners is luxury casting indeed. Hermann Christian Polster is not the most imposing of Ministers, kindly rather than authoritative, but he is steady and pleasant to hear. Doubts do however arise about the two principals. Richard Cassilly is a forthright Florestan, but the sound of his voice is not altogether sympathetic with an occasionally rather plangently metallic edge, and his opening cry of “Gott!” hardly grabs the attention. Edda Moser seems to be slightly over-parted in the title role, although she does have the agility to negotiate the more coloratura aspects which Beethoven toned down considerably in Fidelio. She blends well with Donath in their duet Um in die Ehe which Beethoven afterwards cut from the score. These two and Büchner are charming in the similarly omitted trio Ein Mann ist bald genommen. Adam also comes over well in the barnstorming aria that Beethoven originally composed for Pizarro to conclude Act Two. The dialogue is well delivered by the singers themselves. All of them, with exception of Cassilly, are native German-speakers. It is tracked separately for those who wish to avoid it. When DG came to prepare their CD Beethoven Edition in 1997 they included Leonore in a historically informed performance conducted by John Eliot Gardiner. That recording constitutes the principal competitor to Blomstedt’s set. Gardiner uses generally lighter-weight singers, and his choice of material (including a different Prelude to Act Two) shows some variations from the edition employed by Blomstedt. A number of small revisions are based on Beethoven’s various amendments. He also considerably abridges the spoken dialogue, with the result that his recording — with generally faster speeds — runs to some fifteen minutes less than Blomstedt. A later recording conducted by Marc Soustrot describes itself as the world première recording of the “1806 version” – that is, after Beethoven’s initial revisions but before the wholesale overhaul of the score undertaken eight years later. The result is a somewhat uneasy compromise between the 1805 Leonore and the 1814 Fidelio — neither one thing nor the other. In the end if you want to hear Leonore as Beethoven originally conceived it, with the additional material he later discarded – and it is a most interesting journey of discovery – choice comes down to Gardiner and Blomstedt. Personal preference may safely be employed as the yardstick to judge between the former, a swifter traversal of the score with a lighter-voiced cast and period instruments, and the latter with a more central Fidelio cast and a more robust approach which unapologetically places the work in the centre of the Beethovenian canon. Brilliant Classics, sometimes remiss about such things, provide a full libretto online as well as a substantial synopsis and a useful historical note. If you want Leonore as far as possible in the form that Beethoven originally conceived it — and without Gardiner’s sometimes controversial amendments — then this Blomstedt recording remains eminently satisfactory.